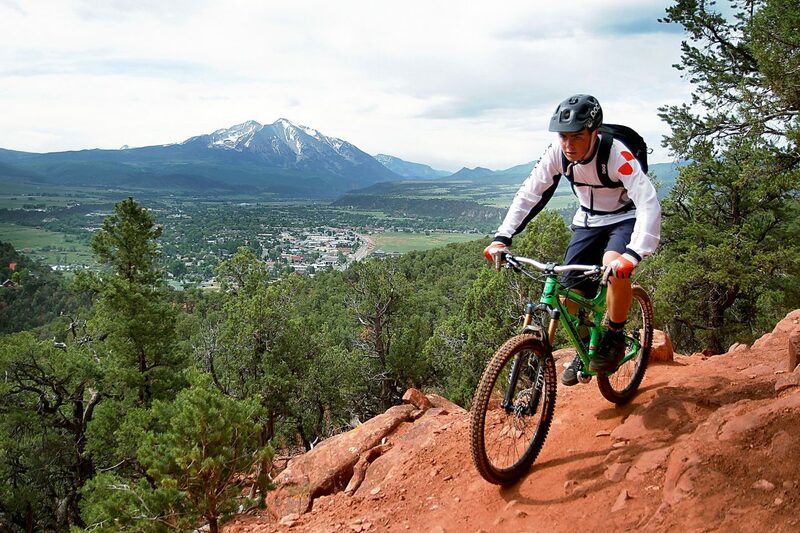 A newly proposed Bureau of Land Management area land-use and travel management plan could stand a few tweaks, but is generally a move in the right direction for local mountain biking interests, according to the director of the Roaring Fork Mountain Bike Association. “This has been a long and sprawling process, and we’re happy to be a part of it,” said Mike Pritchard, head of the RFMBA, which issued a nine-page list of protests and appeal comments on the proposed Resource Management Plan issued by the BLM’s Colorado River Valley Field Office earlier this spring. “It contains some good news for us in some locations, especially the Crown,” he said of the popular mountain biking area southeast of Carbondale along Prince Creek Road that would obtain Special Recreation Management Area status under the new plan. However, “we do have some protest issues that we feel will have to be resolved before the management plan can be finalized,” Pritchard said. A coalition of statewide motorized vehicle groups is more critical in its assessment of the proposed BLM plan, saying it does not adequately consider the economic impact of restricting motorized access in certain areas as proposed. According to a formal protest and appeal filed with the BLM on behalf of the Colorado Off-Highway Vehicle Coalition, the Colorado Trails Preservation Alliance and the Colorado Snowmobile Association, the plan in effect closes half of the existing multiple-use routes to motorized vehicles within the local BLM office’s planning area. “Our organizations vigorously assert these decisions are arbitrary and capricious as a matter of law and fact, and are made in violation of numerous federal planning requirements,” the groups state in a 70-page letter appealing the proposed plan in its entirety. In late March, the BLM released the proposed management plan and final Environmental Impact Statement for more than 505,000 acres of federal lands covering parts of six counties, including Garfield, Eagle, Pitkin, Mesa, Rio Blanco and Routt. The proposed plan “seeks to balance resource use with protecting sensitive resources” for the next two decades, according to the BLM. It’s the first time the management plan for area BLM lands had been revised in 30 years. The proposal designates approximately 675 miles of routes for motorized use and 587 miles for non-motorized use. It would also manage about 34,400 acres for existing wilderness characteristics, including parts of the Thompson Creek area west of Carbondale and the Deep Creek area in the Flat Tops northeast of Glenwood Springs. The portion of Deep Creek crossing BLM land is also recommended as suitable for Wild and Scenic River designation. Area BLM spokesman David Boyd said the agency is working to resolve protests from groups ranging from off-road users to oil and gas leasing interests before a final record of decision is signed. That is expected to be sometime this fall, Boyd said. Protests must be addressed before the document is signed, he said, while appeals of some of the route-by-route decisions contained in the plan can still be addressed after the plan goes into effect. Key among the protest concerns for the local mountain biking group, Pritchard said, is the plan’s proposed boundaries for protection of wilderness characteristics in the North Thompson Creek area, which is home to the popular Lorax Trail. That would involve what Boyd called an “interesting blend” of uses, allowing for both mechanized (mountain bikes) and motorized routes, but also protecting wilderness characteristics within the larger management area. The RFMBA proposes shifting some of those boundaries to the south and east to avoid problems with maintaining or obtaining approval for rerouting trails within the Thompson Creek area in the future. The RFMBA also suggests designating a trail network on BLM land in the Fisher Creek area in Spring Valley south of Glenwood Springs as a Special Recreation Management Area, and creating a trail connection to the nearby Colorado Mountain College campus. “This proposal will provide easy opportunities for the local college community … and neighboring residential areas … to access existing nearby trails,” according to the group’s protest/appeal letter to the BLM. Attention should also be given to expanding the Red Hill area trail network should the proposed Sutey Ranch/Two Shoes land exchange ultimately be approved. That proposal calls for putting existing ranchland on the north side of Red Hill in the BLM’s hands, in exchange for public land south of Prince Creek going to the owners of the Two Shoes Ranch. The proposed land exchange is pending final approval. In addition, the RFMBA said it would like to open discussions with the BLM about eventually creating a bike trail connection from the South Canyon area west of Glenwood Springs to the top of Red Mountain and the Jeanne Golay trail system. Those talks are in the “very early stage,” Pritchard said.